Ok, I have a slight confession to make. After watching the US get slammed by Ghana and Germany use England as a training match…I missed a few players! So let’s just say that I’m gonna have to give you guys a post-championship survey once the games are over. So far we have looked at our fave footballers from United States/Brasil/Cameroon, England/Ivory Coast/Portugal, and Mexico, Argentina, Switzerland, Algeria and Ghana. Now it’s time for the Netherlands, Japan, Chile, South Korea, and Uruguay. above: Nigel De Jong | Current Team: Manchester City | Age: 25 | We need to go to Amsterdam more often Hot. Ibrahim Afellay | Current Team: PSV Eindhoven | Age: 20 | Only gonna older and hotter Hot. Eljero Elia | Current Team: Hamburg SV | Age: 23 | Surinamese Hot. Michel Vorm | Current Team: FC Utrecht | Age: 26 | Looks good in gloves Hot. 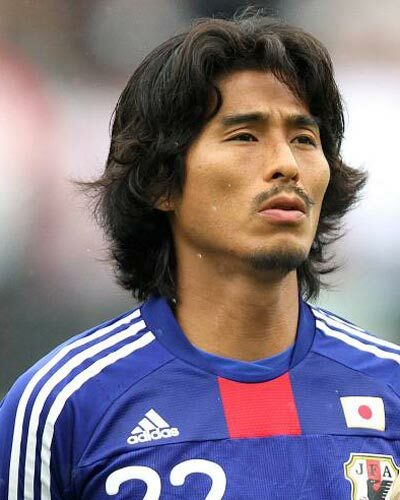 Yuji Nakazawa | Current Team: Japan | Age: 32 | Bohemian hot. Alexis Sánchez Sánchez | Current Team: Udinese | Age: 21 | Shorty doo-wop hot. Jean Beausejour | Current Team: América | Age: 26 | We’re kinda speechless hot. Mark González | Current Team: CSKA Moscow | Age: 25 | Fast on the field hot. Cha Du-Ri | Current Team: SC Freiburg | Age: 29 | Super nice guy hot. Luis SuÃ¡rez | Current Team: Ajax Amsterdam | Age: 23 | Making hella goals hot. Sebastián Abreu Gallo | Current Team: Botafogo de Futebol e Regatas | Age: 33 | Jesus-hair hot. Up next:Â The rest of the world – Cheers & Happy Watching Ladies! El DeBarge Wins the BET Award For Amazingness! and what about Canavarro, van Persie, Thierry Henry?